One of the remaining truly remote treks it goes behind the massif of Mt. Dhaulagiri (8167 m.), and the seventh highest mountain in the world into remote areas rarely visited by anyone. Fly form Kathmandu to Pokhara and drive to Beni and then trek up the Myagdi Khola (river) valley to the Italian Base Camp (so named because the first Italian expedition to Dhaulagiri used this site for their base camp) and then traverse the "French Col” or Hidden Valley (where you may come across the remains of an aircraft which was used in support of a Austrian-Swiss expedition but, was abandoned here after it crashed) to climb out of the valley via the Dhampus Pass into the Kali Gandaki river valley at Marpha before trekking to Jomsom and flying out to Pokhara and Kathmandu. This is a hard trek but the views of Mt. 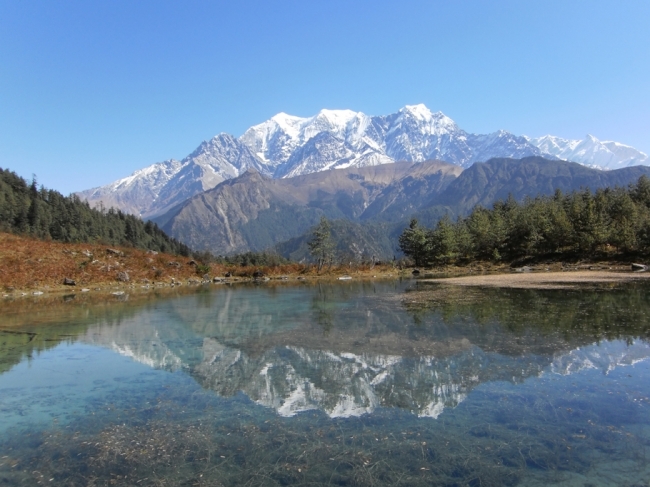 Dhaulagiri, the peaks of the Annapurna massif and lesser peaks like Nilgiri are absolutely stunning, the location is truly off-the-beaten-track and the wilderness is unspoilt. Arrrive Kathmandu. Depending on the arrival time of your flight sightseeing of Kathmandu. Final preparations for your trek or if you feel that you are adequately prepared sightseeing of Patan Durbar Square, Swoyambhunath and Bodhnath. Day 03 Fly to Pokhara and drive to Beni . Fly to Pokhara and drive to Beni (1000m). Trek from Beni up the Myagdi Khola (river) valley to Babichaur. Day 05 Trek to Dharapani . Trek to Doban (2630m) along a very difficult path where you may need to rope up. Trek to Italian Base camp (3500m). Day 10 Rest day at the Italian Base Camp. Rest day at the Italian Base Camp. Trek to the Glacier camp (4250m). Trek to Dhaulagiri Base camp (4650m). Day 13 Rest and acclimatization day. Trek to the “French Col" or Hidden Valley. Another rest day to admire the surrounding peaks and perhaps do some exploring. Day 16 Cross the Dhampus Pass and descend to Yak Kharka. Cross the Dhampus Pass at 5200m and descend to Yak Kharka. Day 19 Fly to Pokhara and on to Kathmandu. Fly to Pokhara and on to Kathmandu.